C. T. Bauer College of Business alumnus Derek Shaw is opening The Nook Café across the street from the business college where he earned his MBA in 2012. This fall’s late-night study sessions will be filled with the sweet aroma of a student’s favorite beverage – coffee – the official University of Houston Cougar Blend from the campus’ newest café, The Nook. Shaw, who completed his BBA in Marketing & Sales in 2003 and MBA in 2012, has had his share of UH dining experiences. “I, like most students, was forced to wait in massive lines for the most expensive 12 oz. vanilla latte with no foam that I would ever purchase in all of my life,” Shaw said. Shaw had the café designed with students in mind in more ways than just displaying student art. The business model was designed to appeal to students, while still giving back to the university. Shaw and Winjberg looked at the other café options on campus for inspiration, examining what they lacked and what could be better. “The Nook Café concept has been a constant work in progress to cover all of the issues that students don’t care for about other coffee shops to see if we could build a business model that would address student concerns and be able to help support the university’s initiatives at the same time as a loyal local small business,” Shaw said. Shaw has partnered with Wijnberg to start the business, and has made connections with other Houston businesses to stock the shop. The coffee shop and wine bar will serve beer from local breweries and wine hand-picked by the sommelier of 13 Celsius in Midtown, along with pastries and cakes from Houston bakeries and juices made with local fruits. 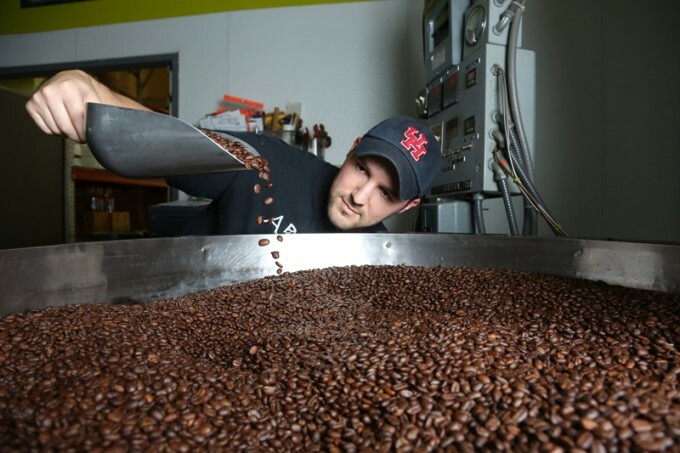 They have also pulled in Avi Katz, another UH alumnus and owner of Katz Coffee, to participate in the Cougar Blend give-back. The partnerships Shaw has built over the past two years have been invaluable in starting the business, Shaw added. A smart phone app will also be launched along with the café, which will allow customers to place a custom order, pay by credit card, set an arrival time and simply pick up their order and go. This idea came from a class Shaw took while obtaining his MBA, where he learned the effectiveness of disruptive information technologies being introduced to a market. “From Randy Webb and the Program for Excellence in Selling giving me a strong undergraduate background in sales and business-to-business relationship management, to Laura Cardinal and her MBA Strategic Management class, to Bauer Dean Latha Ramchand and her amazing leadership and support of Bauer and its alumni, I cannot say enough wonderful things about my experiences with Bauer,” Shaw said. The Nook’s doors will open during the Fall semester. Until then, Shaw is preparing the café for opening day.